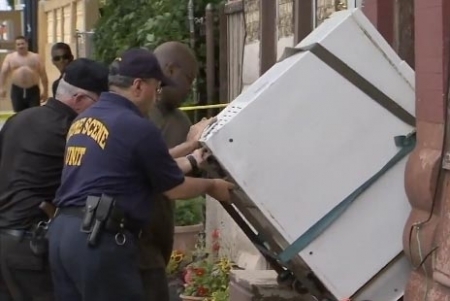 Police investigators discovered the naked body of an 83-year-old grandmother inside of a basement freezer this morning in the city's Feltonville neighborhood. Police were tipped of by an in-law that the woman, identified as Andrea Carrasquillo, had passed away in January and was placed in the freezer by a relative when they got scared. Neighbors on the 4500 block of Lee Street did not find it odd that they did not see her because she did not leave very often. The medical examiner will perform an autopsy to determine what happened to Carrasqullo. Police are searching for her son. A food truck explosion near an auto body shop in the city's Feltonville neighborhood this afternoon left 11 injured and at least 2 critically. It happened just before 5:30 p.m. at 3rd Street and Wyoming Avenue. A propane tank on the La Parrillada Chapina food truck exploded while parked outside an auto body shop. A 40-year-old woman and a 25-year-old woman each suffered second and third degree burns and were transported to Albert Einstein Medical Center. Several other people were also injured and taken to area hospitals. Officials are investigating the cause of the explosion. Five children, ages six-months to 9 years old, were found unattended in an SUV outside of the Shop Rite on Aramingo Ave. in Port Richmond Tuesday morning. A concerned citizen discovered the children and notified police at 11 a.m. The vehicle was running with air conditioning turned on with access to water and snacks, but the children were crying and alone. Police determined that the vehicle belonged to 39-year-old Karin Thompson who runs a daycare out of her home. All of the children attend her daycare. She left them in the car while she went shopping in the food store. Police found her inside and placed her under arrest. She is charged with five counts of Endangering the Welfare of a Child and five counts of Reckless Endangering another Person. The kids were taken to St. Christopher’s Hospital to be checked out and were each found ok. Warm and muggy, chance of a thunderstorm, temperatures holding in the 80s this evening in Center City.